We are grateful for the support of the Critical Ecosystem Partnership Fund (CEPF) which is helping us continue our work in western central Madagascar. As with many of our projects on this uniquely biodiverse island, the inclusion and empowerment of local communities in conserving wildlife and habitats is central to what we are doing in the region. This is despite security concerns requiring the consultation and support of local authorities and law enforcement agents. Instead of looking to conserve isolated species our focus is on entire habitats, whenever possible. This highlights the need for balance between flora and fauna together with the requirements of local populations. During the first six months of 2018, our field coordinator Lucien Randrianarimanana has led local people within five communes of the Maevatanana-Ambato-Boeny area as they conducted surveys to gather regional knowledge of species and habitats. Results were followed by field visits to several sites identified as being of high bio diversity importance. 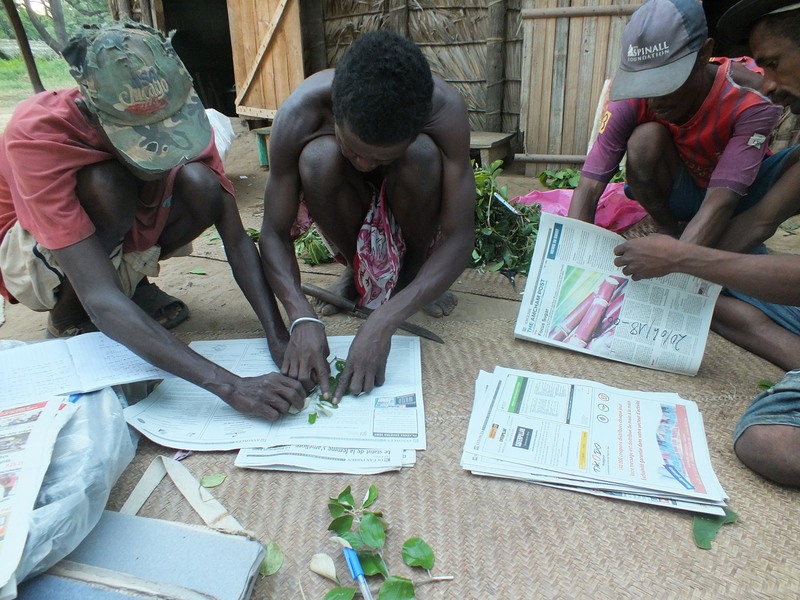 In addition Lucien has worked with local communities at our longer-term forest sites installing botanical plots to aid identification of tree species. A floral inventory has also begun with over 77 botanical specimens collected so far. Overall the surveys have proven to be valuable, and continue to support the view that Madagascar is a conservation ‘hotspot’ with diverse and unique wildlife. Such as the discovery of two roosts of Madagascar flying foxes, one of the projects main species, and considered Vulnerable on the IUCN Red List. The team will now investigate options with the respective local communities to help protect these roosts from hunting and other disturbance. Local knowledge also suggests the Critically Endangered Madagascar big-headed turtle is still present at certain sites. Fished to extinction in the larger lakes there is evidence it can still be found in smaller stretches of water, some rivers, and sacred lakes. More conclusive evidence is needed, but if proven correct there is the potential to make a significant contribution to the conservation of this unique species which is considered to be the world's most evolutionarily distinct and globally endangered reptile. Observations from local people have also proven valuable at Lake Komadio where it is said that two “damba” species are present, one with a black spot, which may be the Critically Endangered Paretroplus Maculatus. Further investigation is necessary, but if confirmed then this relatively large lake could be considered a priority site for conserving this particular species. And, whilst local people claim that freshwater turtles are no longer present, if fishing practices can be regulated this might be a potential site for re-establishing Madagascar big-headed turtles in one of the more significant expanses of water. An established but inactive community association at the site could be reanimated, not only to better manage the lake but also to try to conserve the remaining forests around it which support one of the flying fox roosts mentioned earlier, plus small numbers of crowned sifaka and possibly other lemurs. The project also continues to support local communities at Anaboazo, Ambatomasina and Mangidirano/Alan’Ihaso to monitor lemurs and the threats to them and to the forests. Two community members at each site patrol their respective forests ten days per month. Altogether this is an extensive conservation project with a great deal of potential for the future.